Bodybuilding is hard for most people, but for guys like Phil it's an excruciating joy. See how he beat cancer, lives with a prosthesis, and still stays ripped! I began working out once I was fully healed from all the chemotherapy once my cancer (Osteogenic Sarcoma) was gone. I couldn't play any of my regular routine sports, such as soccer, basketball, tae kwon do, snowboarding, etc. Staying fit was of primary importance in my life, so I decided to pick up weightlifting in a home gym (Goodlife Fitness, Mount Pearl, Newfoundland). I started off like every average Joe, watching others at the gym, learning and progressing as the days went by. After 2 years or so passed by, I began to gain more knowledge on what training techniques worked best for my body, so I began to grow more and more. During this time I was about 18-years of age and I met someone at the gym by the name of Jeff Nippard, who was kind enough to help me with my dieting and training for the NLABBA Bodybuilding Show; he saw I was greatly interested. From there, my 12-week-out diet began and November 19, 2011, I placed 3rd in Men's lightweight division, my first ever bodybuilding show. I was at disadvantage due to the symmetry difference between my legs and my lack of practice with posing. This year I'm looking to rock Men's Middleweight class. During the show, I used a training program called, Max OT, which consists of heavy weight, low reps, 9 sets in total per body part. Now on off season, I'm currently training with the workout program called FST-7, which is high volume training. I can only my train my right leg due to the removal of my left knee and partial fragment of my femur bone, due to cancer. Low-carb diet worked best for cutting. Meals separated every 2-3 hours. Whey protein, creatine, dextrose, glutamine, beta-alanine, multi-vitamins, fish oils, BCAAs and casein protein. Bodybuilding pushes your body to a whole new level. It takes training far past the gym; you're training day-in and day-out, all the cooking, dieting, meal preparation and of course the time you spend in the gym. Training like a bodybuilder takes so much will power. If one is able to commit to the lifestyle of a bodybuilder, it shows dedication of that person's strive for success. My friend Jeff Nippard inspires me to train the way I do. Jeff is two years older than I am, and he helped me train all throughout my training process for the NLABBA. 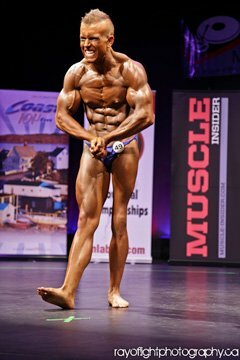 Jeff is also a bodybuilder and competed in two NLABBA shows, and is currently 3 weeks out from Natural Nationals in Winnipeg. Proving to people that anyone can do anything they set their mind to. I can only train and put pressure on one leg in the gym. My left leg is so fragile due to my prosthesis. This makes me have to be very careful and flexible with all the exercises I do, laying and standing. I plan on competing in the 2012 NLABBA, and if all goes well, Natural Nationals the following year in 2013. Stay dedicated, motivated and don't let anything get in the way of your goals. Phil Heath is my all time favorite bodybuilder. Ronnie Coleman and Dexter Jackson are also two other bodybuilders that I really admire. When I first started working out I used the muscle gain program for teens, where I found a sample eating plan and supplement plan to get me started. Now I usually only use bodybuilding.com to get all of my supplements.